One of DC Comics most iconic science fiction heroes arrives on Blu-ray and DVD that tells the origin of test pilot, Hal Jordan who not only becomes the superhero known as Green Lantern but also becomes part of something even bigger, the Green Lantern Corps, an alien intergalactic peace force. Like the comic movies before Green Lantern First Flight (Justice League: New Frontier and Wonder Woman), DC Comics and Warner Animated continue to push the boundaries of their creations and best of all, they make it accessible to viewers of all ages and no background history of the comics is required. 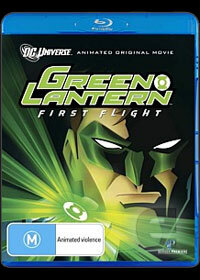 It should be noted that Green Lantern First Flight is a modern interpretation of the original comic story so some purists may be offended at the changes to history, however for me, even though I'm quite familiar with the original comics, this movie was a refreshing tale that feature action, drama, intrigue and comedy. The movie itself begins with an alien craft crashing on Earth and a dying alien named Abin Sur uses his ring to find a worthy successor and this successor is test pilot Hal Jordon (Christopher Meloni), a man who knows no fear. Bestowed this powerful ring, a ring of the Green Lanterns can create green energy constructs and is only limited by the users imagination. Needless to say, it is a powerful weapon that can be used for order. Once the Guardians of the Universe, the leaders of the Corps discover that a "human" has been given the ring, he is summoned to OA by a small group of elite Green Lanterns and from there, his initiation begins. Unfortunately for Hal, he is forced to go under the wing of Sinestro, an honor guard, however upon further investigation, Hal discovers that Sinestro may not be the man he pretends to me. Although the story was thoroughly enjoyable, some parts of the story seemed forced and a little contrived, however trying to fit in the origin of Green Lantern and his place in the bigger universe is a difficult task, especially by the time constraints. Never the less, the action is oozing with superhero goodness and hopefully we'll see a sequel to this great interpretation of Green Lantern. - Duck Dodgers "The Green Loontern"